I may not be the busiest person in the world, indeed I'm often looking to be busier; things to keep me occupied are good! At any one time I'll have a few side projects on the go at any one time which makes accomplishing other things difficult. Each of them competes for my time in ways that, alas, cannot fulfill another. In a way they are the four base categories I can fit any part of my life into if asked at any point. For example, this blog post would be considered a side project as it's something I like to do but is non-essential to daily living. It has the benefit of allowing me to vent, as well as giving me some writing experience and improving the SEO rankings of my website, hence my brand. Other side projects would include developing drupal modules and general personal research and development. My justification being that I'll need to stay at least towards the head of the curve so I can be ready for the next best thing. I also have to give an amount of attention to she who must not be named and to work. Once all of these are taken into account I am able to put time into the final category: sleep. This doesn't mean that I will receive no sleep, it does however mean that my sleep time will not be the full amount I need to ​feel refreshed. 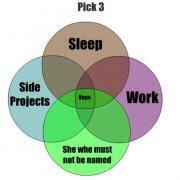 It has become quite obvious that out of these four categories, I really, truly only have time to accomplish three. This is unfortunate as more hours in the day or some kind of time dilation device would really help. However, these are currently impossible, so I guess I'm sleeping when I'm dead. You also need chill time in your busy schedule which could inter mingle with she who must not be named time! Just thought I'd take the time to say I've enjoyed every bit of your blog and I have you bookmarked to check out new stuff you post!